Bay Park is a great find. It overlooks beautiful Mission Bay and offers a bird’s eye view of both Mission Bay and the Pacific Ocean from the high vistas of its hilltop. While virtually everyone has seen Bay Park as they speed by on the Interstate-5 Freeway, few know much about it. 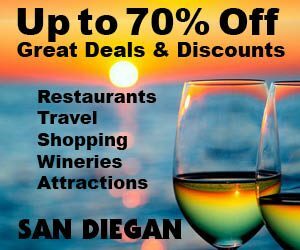 Those who live here say it’s a San Diego treasure because it possesses all of the amenities city dwellers crave to enjoy including great restaurants and essential shopping destinations,and no crowds. It’s one of those great discoveries still under most city dwellers’ radar. With easy freeway access and the fact that a Coaster stop is scheduled to be built in the not too distant future, it’s worth your while to get to know all that it has to offer now rather than later. Plus, Amtrak chugs through Bay Park several times a day as well. And the San Diego Trolley has a trolley stop at the southernmost entrance to Bay Park. So all coastal freeways pass by Bay Park. Yes, there is a lot to see and do in Bay Park. Also interesting is that both of Bay Park’s main streets have virtually the same name, which is a bit confusing at first. And both Morena Boulevard and West Morena Boulevard travel in a north south direction. So down these main streets expect to find many restaurants, lively bars and on the side streets you’ll find two world-class microbreweries with beer tasting lounges. As for Bay Park’s ambience, it’s as local as San Diego gets. Plus, many of the businesses are owned by people who live here. So the mood and tone of Bay Park has a local welcoming feeling and the businesses beam with a pride of ownership. As for Bay Park’s Restaurant Rows, it’s a source of great enthusiasm as more and more people discover Bay Park. These restaurant rows can be found all along both West Morena Boulevard. Until rather recently these nightspots have been well under virtually everyone’s radar for being an eclectic place to enjoy lively bars, cocktail lounges, and lots of great restaurants. Now, many in the know opt to come here rather than battle the terrible parking conditions and the crowds in Little Italy, Mission Valley and Pacific Beach. Yes, Bay Park is definitely the less known of the four communities overlooking Mission Bay Park, which is San Diego’s 4,600 acre aquatic wonderland. Locals from other suburbs know it mostly as being next to the enchanting grassy park that borders Mission Bay for a walk, bike ride, a swim, a place to go rent a boat and go sailing or a fun place for a picnic along the seashore. The other three communities surrounding Mission Bay are South and North Mission Beach and Pacific Beach. Mission Bay is best known as the home to SeaWorld. Yet, Mission Bay is also an aquatic wonderland for water sports galore including swimming, sailing, jet skiing, paddleboarding, and on land bike riding, jogging and picnics. Also calling Bay Park home are a slew of essential, yet eclectic businesses such as a wholesale florist and a direct to the customer wholesale fish market, as well as low price factory outlets for appliances such as a huge Sears Outlet Store and Pacific Sales focusing on high quality appliances and televisions for less. So browsing around the off streets can bring you great bargains and tons of fun. 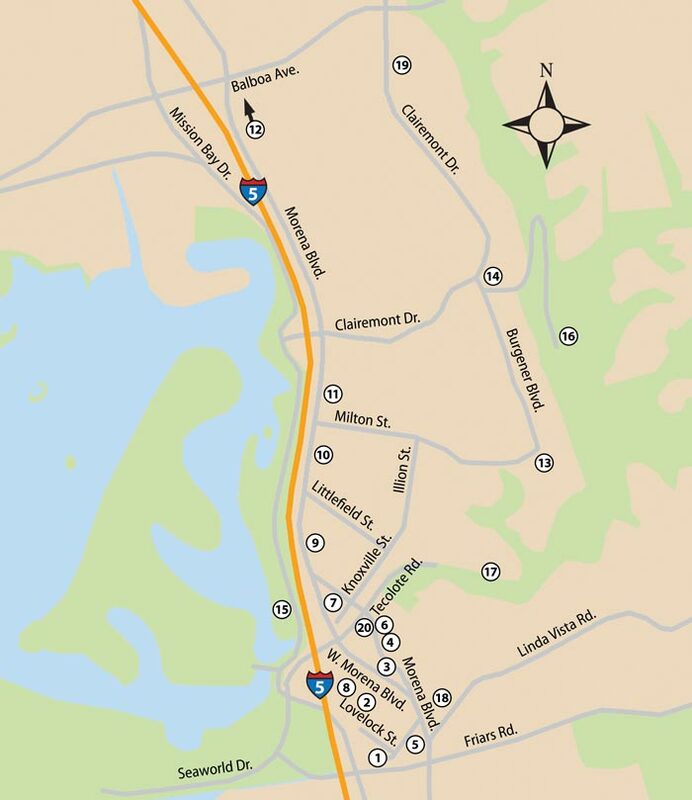 Getting to Bay Park is accessible from a variety of ways including the south end via the I-8 Freeway exiting at Morena Boulevard and traveling north along West Morena Boulevard which splits as you cross the San Diego River and if you veer to the right you will be heading up the hill past the University of San Diego and eventually end up in Linda Vista. So veer to the left and stay on Morena Boulevard. At the second signal where Napa Street bisects Morena Boulevard is a hub of dining and shopping alternatives. See map. At this stop light you’ll have several interesting alternatives. One is to stop for a bite to eat at the most popular sit down Mexican Restaurant in Bay Park, Tio Leo’s (18). It’s a local standout for over 20 years with live music in the evenings. Head to the left at the signal from Morena Boulevard and you’ll be traveling on Sherman Street that turns into Anna Street. Here you’ll find two huge appliance stores. One is Pacific Sales and the other is a Sears Factory Outlet Store. Poking around on these side streets will result in discovering many treasures. One such discovery is a ladies’ purse and bag shop at Loveland Street and Sherman. Another treasure is Reusable Finds (5) at 5320 Custer St. (858-449-4381). Their philosophy is that one man’s junk is another man’s treasure. So come in and browse one of San Diego’s favorite antique stores. See Shopping. A great place to buy fresh fish at wholesale prices is Catalina Offshore Products (2), which is located at 5302 Lovelock St. It’s just off of Sherman Street (619-297-9797). With the philosophy of dock to dish you’ll be getting the freshest fish at wholesale prices. And if you are a sushi lover this is the place to get it fresh. An added plus is that you can also buy it online and they will send it to you via FedEx with next day delivery. Back on West Morena Boulevard a block further up the street you’ll come to a fork in the road with West Morena Boulevard veering off the left and Morena Boulevard veering off to the right. Both streets are filled with unique and interesting places to shop and dine. Assuming you veered to the right you’ll be totally delighted to discover several mainstays for outstanding cuisine and a Valero Gas Station (3) offering the cheapest prices in Bay Park. So fill up here. Across the street is a popular, no frills Mexican Restaurant offering sit down plastic booths or food to go. It’s Nico’s Mexican Restaurant (3) at 5151 Morena Place. On the next corner is a local Sicilian restaurant you should definitely not miss. It’s Sardina’s Italian Restaurant (4) at 1129 Morena Blvd. (619-276-8393). The owners built this restaurant from the ground up and in the process it has become one our city’s most recommended places to eat for great tasting Sicilian/Italian cuisine. Ask for owners Tom and Sal, and tell them Barry recommended that you eat there. The atmosphere is warm and friendly and many of the servers are members of this family owned restaurant. Plus their full service cocktail lounge is always bustling with happy people. You’ll undoubtedly like the family atmosphere of this local place. In the next block is a true legend. For the best Cuban cuisine this side of Miami, dine at André’s Cuban and Puerto Rican Restaurant (6) at 1235 Morena Blvd. (619-275-4114). André’s has been a favorite for 33 years for their savory Cuban and Puerto Rican dishes served in an atmosphere of tropical plants, romantic background music and attentive service. And if you are looking for a place for a wedding reception or a family reunion hall, look no farther than André’s Banquet Hall. A testimonial as to the popularity and authenticity of the cuisine, they cater to the Puerto Rican baseball players by providing meals to the players’ locker room after the games at Petco Park Baseball Stadium in Downtown San Diego. André’s also has a small grocery store filled with hard to find Cuban and Puerto Rican items. At the turn in the road next to the Shell Gas Station (20) is the Sidecar Dive Bar, a local meeting place with microbrews on tap and pool tables. Across the street in yet another local haunt, called the Clutch Bar. However, your next destination is undoubtedly one of the ten ­wonders of the world. It’s a unique Christmas store called City Lights Year-Round Christmas Gifts, Collectibles and Emporium (7) at 1212 Knoxville St. (619-275-1006). It will mesmerize you with glittering ornaments, ­holiday decor and jolly Santas. Use their coupon to receive a free ornament with purchases over $15. Don’t miss this major San Diego city attraction celebrating 28 years in business. And seeing 40,000 sq. ft. of Christmas lights and collectibles, ­including California’s largest collection of Department 56 scenes is an incredible sight to see. Seeing is ­believing! And across the street is the Coronado Brewing Company (7) at 1205 Knoxville St. (619-275-6700). They brew world famous beer in a 22,000 square foot facility with a nice comfortable beer tasting room. They’re open weekdays 11 a.m.–9 p.m. and until 9:30 p.m. on Friday and Saturday. By now you are probably thinking that you have died and went to heaven, because your wife can go shop for Christmas decorations and you can sip a beer at a blue ribbon micro brewery. It’s also dog friendly. So bring your pooch. Hard to miss is the new Armstrong Nursery on the corner of Knoxville and Morena Boulevard. It’s a local landmark. At one time the southern end of Bay Park was know as the Morena Furniture District (8) and it’s still home to several of the most recommended places to purchase furniture, home decor and accessories in San Diego. Two notable destinations are Hauser Patio (8) that offers the finest rattan furniture in San Diego with its well appointed showroom that’s second to none. The other super store is Jerome’s Furniture Store (8) in the Morena Plaza Shopping Center at 1190 West Morena Blvd.(858-924-1871). This mega furnitures store is 100,000 sq. ft. in size and has furniture and mattresses galore. It’s open daily from 10 a.m. to 9 p.m. Jerome’s has 8 locations to serve you in San Diego County. Here too in the Morena Plaza Shopping Center is Cole’s Carpets (8), a true legend in our city with multi locations to serve you. Their claim to fame just as is the case for Jerome’s is that over the past 40 years they have carpeted and furnished the homes of tens of thousands of San Diego residents. So these are two stores to add to your shopping list when you are looking to beautify your home. Also calling Morena Plaza Shopping Center home is an Armstrong Nursery, Toys “R” Us kids store and a popular Petco (8) pet animal department store. So as you might have guessed this area of Morena Boulevard and West Morena Boulevard is easily accessible by lots of small side streets. This makes the area easily accessible by car or by foot, which is what most shoppers do. So if you’re up to it, park and walk. If you’re a barbecue lover, then you’ve got to sample the cuisine featured at Bull’s Smokin BBQ (8) at 1127 West Morena Blvd. (619-276-2855)[bullssmokinbbq.com]. Happy Hour 2 p.m. – 6 p.m. Daily. Bull’s offers indoor and outdoor seating and it’s dog friendly too. Proceeding further up Morena Boulevard (see map) past the next signal you will come the High Dive Bar & Grill (9) featuring dozens of microbrews on tap and savory food while you hang with the locals. It’s at 1801 West Morena Blvd. (619-275-0460). And if you think you’ve had the best tasting hamburger in town, think again and order their delicious Gorgonzola Burger, smothered in caramelized onions with a TON of French fries. Plus, they have the friendliest bartenders and patrons in town. It’s extremely difficult to sit at the bar and not make a new friend. See Restaurants. Your next Bay Park Restaurant discoveries are family owned treasures with one Restaurant catering to the young and the other to the young at heart. So if your favorite libation is a cocktail, then you’re looking for Luce Bar & Kitchen (10) at 1959 West Morena Blvd. (619-275-0321), which is in the same building as the mainstay in the community for serving fine Italian gourmet cuisine, Baci Ristorante Italiano (10) it’s at 1955 Morena Blvd. (619-275-2094). Both restaurants have a loyal following. If you’re a local, you’ll say that the Bay Park Fish & Grill (10) is one of your favorite places to go for fresh seafood. It’s also a perfect gathering place for friends and family to dine together. So pick your spot inside or on the sidewalk patio. Next door to the fish market and restaurant is the one of the few independent butcher shops in town. This stronghold in gourmet staples is Siesel’s Meats (10) (619-275-1234). Especially during the summer holidays it’s filled with Bay Park residents buying aged beef to cook on the barbee. Despite it’s small size it’s crammed with every gourmet item imaginable be it a rare wine or a hard to find spice. Other notables getting a name for themselves are Santana’s Mexican Restaurant (10), the Silver Spigot (celebrating 75 years in business as a legendary nightspot that’s open from 10 a.m. till 2 a.m. daily). Then there is the Offshore Tavern, plus Dan Diego’s Euro Cafe & Pub (11). And way, way down West Morena Boulevard is the original Costco (12). Originally named The Price Club, after founder Sol Price. Anyone who has ever been to a Costco knows that the best hot dog and soft drink special in the universe costs ($1.62) with tax for a foot long hot dog and a soft drink. So tons of locals shop here, eat here and get wholesale prices for their gas too. If you’re relocating to San Diego or are tired of the hustle and bustle of where you currently live, then you undoubtedly should drive the streets of Bay Park, which is the area south of Balboa Avenue and east of Morena Boulevard. Then you should call James Darby (858-560-1100) who has helped over 4500 families buy, sell or refinance their homes across San Diego County. His firm USAFC Reality specializes in helping military personnel find homes in San Diego County. He is also Ceritfied Military Residential Specialist. A host of excellent schools abound in Bay Park including Longfellow Elementary School (13) that teaches all of its students to speak Spanish. With a far sighted approach to education, you can tell that from elementary school through high school children are well prepared for their future. And Bay Park boasts in having excellent churches and superb pastors teaching the word of God to its extensive congregations in all denominations. And being located on a hill many of the churches in Bay Park offer scenic views. Bay Park has a lot to offer. It’s got not one but two restaurant rows, and all are filled with top rated places to enjoy a lively sports bar atmosphere, friendly cocktail lounges, and lots of great restaurants. It also has the best independent butcher shop in town offering aged beef and specialty food items. Plus, there are several wholesale businesses, a few of which are open the public. One of course is Costco offering bulk items for less. Plus, Bay Park has a big fresh fish market and still another sells fresh cut flowers that come directly from the county’s extensive flower fields. And if you are lucky enough to live in Bay Park, you’ll undoubtedly think that it’s a slice of paradise. For everyone else it’s fast becoming more than just a place to come for a walk along the grassy bayside or a place to rent a sailboat at the Hilton Hotel (15) for a day on the bay. Yes, it’s becoming everybody’s favorite restaurant row for a meal at a star studded restaurant at one of Bay Park’s two Restaurant Rows, be it a family meal or a girls night out, this is the place! Plus, it’s way better to spend your leisure time in Bay Park rather than battle the traffic and the crowds in overly popular places like Little Italy, Mission Valley or Pacific Beach by opting for Bay Park as a better alternative. Clairemont is one of San Diego’s best kept secrets. It’s located between Interstate 5 on the West side, Highway 52 on the North side, the 805 on the East side and Interstate 8 on the South side. Plus, it’s home to 80,000 people making it one of the largest communities in the city. The community was developed by Louis C. Bergener and Carlos Tavares in 1950 and interestingly enough they named it after Carlos’s wife Claire. Their vision was to create a “city within a city” and indeed, this is truly a community that has almost everything. For starters, it’s home to the Tecolote Canyon Golf Course (16), which was designed by Trent Jones Sr. and golf legend Sam Sneed. This 18-hole 3,161-yard golf course is located within Tecolote Canyon and has a natural creek bed that runs through it. Tecolote Canyon Natural Park (17) runs through the community of Clairemont with virtually all of the homes being on top of the low hills with the Tecolote park below. The immense park is over 903 acres and is approximately six miles long. There are multiple entrances to the park throughout the community. Some entrances offer public parking and bathrooms. Being a bedroom community the vastness of Clairemont offers many communities within Clairemont. These unique areas include the names of Bay Park, Bay Ho, North Clairemont and South Clairemont. With each of these geographical areas are specific and unique shopping centers. The largest and easiest to access shopping center is at the corner of Balboa Avenue and Genesee Avenue. As you might expect, numerous restaurants can be found within, including Ototo Sushi Restaurant (858-505-8700). And for Mediterranean cuisine, there is the one and only Sufi (20) at 5915 Balboa Ave. (858-278-7770). They feature live music and exquisite cuisine. It’s home to the largest Home Depot in San Diego County along with a couple of supermarkets, banks, and a big Target Department store. It also has a local office of the California Department of Motor Vehicles (800-777-0133). The second major shopping center is appropriately named the Clairemont Town Square, and it’s located at the corners of Clairemont Mesa Boulevard and Clairemont Drive. This shopping center is filled with a wonderful selection of stores as well as being across the street from the only United States Post Office in Clairemont. Stores in this center include a Vons Supermarket, T.J.Maxx, Burlington Coat Factory, a huge movie theatre multi-complex and nearly a dozen restaurants including an Outback Steakhouse, Denny’s and Lightnin Jack’s BBQ. The third shopping center is called the Clairemont Village (14) and its claim to fame is that it was the first shopping center in the world with the popular concept of stores surrounding a big parking lot. 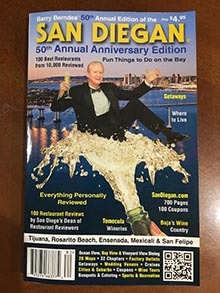 It too has a Sprout’s supermarket and the most popular veterinarian in the region as well as a slew of restaurants and Renzulli’s Jewelry World (619-275-1782). The beauty of Bay Park and Clairemont is that they have easy accessibility to all of the major east-west and north-south freeways. Plus, it’s literally minutes from beautiful Mission Bay and the ocean. Therefore, it has become one of the most desireable middle income residential communities in the city. So if you’re looking for a great place to reside, take the time to discover this under the radar community near everything, especially the bay and ocean.